Featured on this t-shirt is a saying that is so true, find ” My Shelter Dog rescued Me ” on the front with the ” o ” in ” Dog ” looking like the head of a dog with ears and a smiley face. Available in many sizes and colors, also check out the wide variety of shirt styles to get this My Shelter Dog Rescued Me print on. Made from a very durable and comfortable 5.3 oz. pre-shrunk 100% cotton, the My Shelter Dog Rescued Me t-shirt also features a double-needle stitched neckline and bottom hem and sleeves. 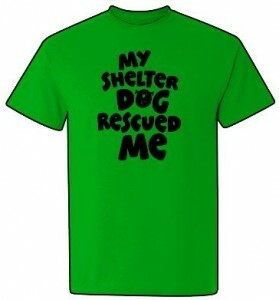 Show your love and support with this My Shelter Dog Rescued Me T-Shirt.